The vision of Workplace Education Manitoba (WEM) is that all Manitobans have access to the essential skills knowledge and training required to determine and pursue their goals related to learning, the workplace and life. 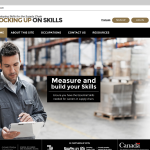 WEM funded the Workplace Essential Skills Assessment for research purposes and to help people involved with training organizations identify and develop the essential skills they need for success in the workplace and life. The web application is used for research by the Social Research Development Council. This website has a closed registration system.